To protect the environment, help the poor and support local development through recycling of clothes. We begin each day of work thinking about the commitment we have voluntarily decided on. To fulfill it conscientiously, we undertake many activities. They are directed both at achieving the best possible results in leading business, and at environmental protection and supporting those in need. Recycling of clothes by TESSO is a pro-ecological activity. Because of it less clothes lie on the overloaded dumping sites. 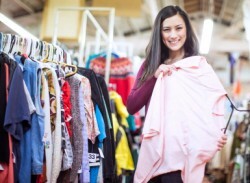 Recycling and reusing clothes facilitates saving space on the dumping sites, at the same time reducing production of new clothes. Tesso also supports charity organizations and in that way people in need receive segregated clothes fit for reuse. Business is not only economic activity. It is also concern for the region and its inhabitants, responsibility for the employees and caring for the environment. TESSO actively participates in activities within the field of Corporate Social Responsibility, regarding it as its mission and privilege. We support the poor, the sick and those in need. Sick children are priority to us.